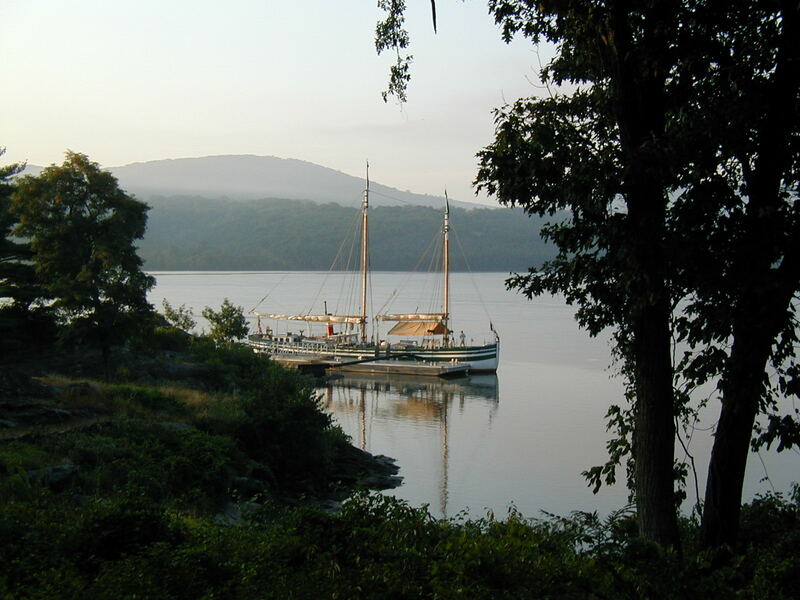 In 2005 the Lois McClure embarked on her first extensive outreach tour to the Hudson River and New York City. It was all so new and exciting, passing through the narrows to Whitehall, transiting the Champlain Canal for the first time and emerging on the historic, tidal and beautiful Hudson River. Every twist, turn and community provides a new landscape and it is easy to see how the 19th century Hudson River school of painters got drawn into the physical grandeur of the place. During the 2005 Grand Journey, we had incredible visits at so many wonderful places but my memories of Cold Spring just across the river and north of West Point are very special. After stopping over at a number of urban waterfronts the dock provided at Constitution Island, directly across from West Point on the “World’s End” turn in the river was all our own. Constitution Island lies adjacent to Cold Springs and during the outbreak of the American Revolution had been fortified earlier that West Point. Our dock was in close proximity to where one end of the iron chain boom connected to this northern shore. With West Point as the backdrop and fleets of tug drawn barges making the difficult passage past us, it was truly like traveling back in time. Constitution Island was such a good dockage that through the courtesy of West Point, we actually stayed there several times during our extended tour and got to know and enjoyed the hospitality of many people at Cold Spring. With these fond memories in mind, when the Putnam County Historical Society, located in Cold Spring, asked if I would be willing to provide a lecture on “What Lies Beneath: the archaeology of Lake Champlain and the Hudson River” I immediately and enthusiastically agreed. On December 3rd, my wife Anne and I traveled to Cold Spring to provide the lecture at the historical society’s Foundry School Museum. The society is housed one of the few remaining buildings from the West Point Foundry which operated in Cold Spring throughout most of the 19th century. What a treat. I was greeted by many familiar faces and friends from our 2005 visit and the warmth of the crowd made it feel like I was coming home. The room was filled to capacity and the lecture concluded with a long and enthusiastic discussion period. One positive reflection of the lecture was repeated invitations to host the Lois McClure when we come back to the Hudson, and several requests to do this lecture at neighboring communities in the Hudson Valley. Just like our time at Cold Spring in 2005, the community was interested in our story and so gracious in their hospitality. I do look forward to an opportunity to return to the Hudson River and Cold Spring in the near future.